We recently had an opportunity to take some workshops from Bonnie Hunter when she visited our guild in June. She’s very kindly mentioned our show in a recent blog post, so to any new viewers from Quiltville, welcome! We hope you enjoy our show. 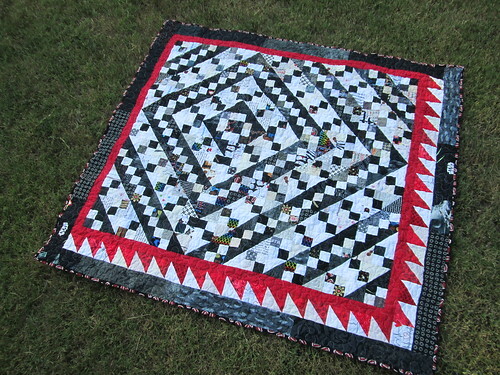 Pam took the “Blue Ridge Beauty” workshop, and whipped up a lap-sized version she called “Inside Out Penguin” (because it’s black and white and red all over, like a tacky grade school joke). Lynn took the “Crabapples” workshop from Bonnie’s book “Adventures With Leaders & Enders!“. You can spot Lynn’s sample in signature Stitch colors of teal and orange! We did our fair share of hobnobbing, too! Bonnie was a delight, as expected! We’re looking forward to making more of her patterns, and the new mystery coming this fall! Hi. I’ve come for a peek from Quiltville. Looking forward to hanging around here too! looks like you both had a great time. congrats on getting Bonnie to mention The Stitch.